Building Green is a unique opportunity to showcase your products and vision for sustainable solutions in the building industry. You can meet new buyers, connect with decision-makers who want to change “business as usual” and network with people who share your interest in sustainable solutions. Join more than 50 exhibitors at Building Green Oslo! Some exhibitors at Building Green have received physical mail from International Fairs Directory with an offer to promote your company at their webpage. Building Green want to make sure that there is no collaboration or contact between Building Green and International Fairs Directory. Building Green recommend exhibitors not to answer or contact the company International Fairs Directory. Find an example of the offer here. See Exhibition Area for available stands, find the right place and book today! Contact Sales Manager Michael Bering for further information regarding prices and possibilities at sales@buildinggreen.eu or +45 4195 1404. Building Green is a leading sustainability event within the Scandinavian building industry. It is a unique opportunity for companies with green ideas, products and solutions to connect with prominent players in the field of the construction and building industry. With a wide target group you can expect a diverse crowd of visitors at Building Green. The majority of our visitors are architects, constructors and designers but craftsmen, students and scientists also join the event which makes Building Green a unique platform to network and present your green solutions. Don’t hesitate to contact us at info@buildinggreen.eu for more information. If you are interested in taking part in Building Green, please fill out the form below and we will contact you. Subsequently, we will send you another fill-out form for you to describe the sustainability of your product or solutions. All potential exhibitors will be asked to verify their sustainable product and solutions for the sake of the credibility and quality of Building Green! We offer various kinds of marketing. Building Green is marketed through a bunch of channels such as VIP partners, magazine publications, papers etc. On this link you can see a complete list of media partners: Click here. 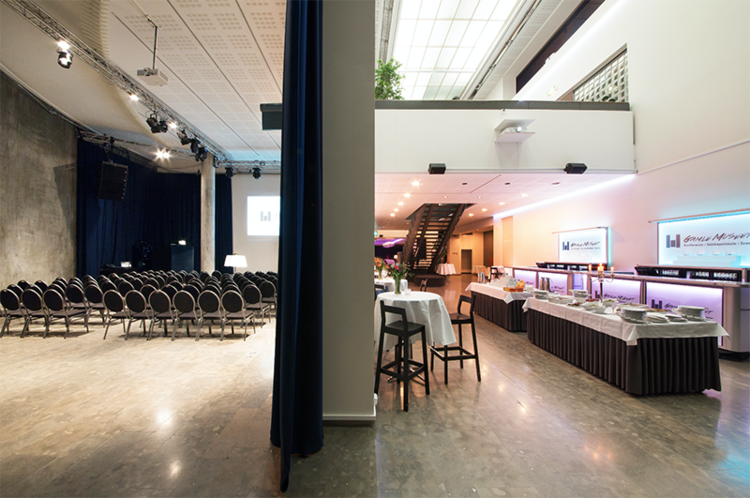 All exhibitors at Building Green Oslo will be promoted with logo, name and description in Building Green Event Guide. The Event Guide is a free physical magazine for all visitors and will be available on web and printed version. At the Oslo Event your logo will be shown on Main Stage & Central Stage during breaks. Get your brochures distributed among the audience on the Building Green stages. The number of seats varies depending on which event you exhibit. Gamle Museet is an award-winning building which formerly housed the official Astrup Fearnley Museum of modern art in Kvadraturen, Oslo. In 2015 the building was redone and made into an event venue. The premises are centrally located in Oslo in close proximity to public transportation. Gamle Museet is only a 5 minute walk from Oslo central station and a parking garage is located within a 2 minute walk from the venue.